Sadly, my mat leave is quickly coming to a close. The reality of having to go back to work is no longer just something I can push to the back of my mind and 'worry about when the time comes.' Because, quite frankly, the time has come... or at least it will very shortly. Which also makes me think about the fact that Callie is nearing her 1st birthday. But I can't even go there. Its all together too overwhelming. Anyway... back to the topic of work. I have already made the decision not to go back to my old job at the kitchen cabinet company. It was a great job and I enjoyed working with Tara, but I want to be able to spend as much time with Callie as I possibly can. The sheer fact that going back to that job means commuting 30 min. each way, every day, is enough to take it out of the equation. So that rules out that option. So this has left me with a bit of a predicament. Financially, we could probably manage if I stayed home as a full-time mommy, but it would mean having to REALLY pinch our pennies, and would most likely mean longer work days for Jon. So again... not a wonderful option. All of this has led back to my interior design possibilities. I originally did my interior design schooling with the thought in mind, that someday, I could hopefully do it from home. Its the kind of career that could very easily be done from one's home and that aspect of it was just the icing on the cake for me. But now comes the tricky part... making a name for myself. Not a literal name, because as you can see, I have already come up with that. I've had my business cards printed and am ready to start handing them out. What I'm talking about is getting a client base started. Its not easy to start out on your own, especially in something as competitive as the design field, but I'm really hoping that through word of mouth and even just getting some small jobs under my belt, I'll be able to get enough work to pay the bills. AND get to stay home with my beautiful little girl. All in all, a win-win in my books. 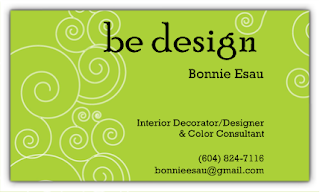 Posted by Bonnie at 2:42 p.m.
GREAT biz cards Bonnie!! I am sure you are great at designing! If I lived there, I would use you...I am very challenged in the decorating field. We have a small place so we keep it simple...uber simple. Me no likey lots of nick nacks...you can thank my mom for that one. She was the nick nack master...way too many. Hey babe- not sure if they'll do it, but my in laws are moving to the Okanagan (currently living in Langley) and are trying to figure out their renovation stuff- I'll send them your info. Bonnie, that's awesome!! I will DEFINITELY keep you in mind and recommend you to anyone that is looking. PS Callie is a DOLL! I so wish you lived closer because I could definitely use your help. Well, if you ever move back to Saskatoon, or want some business if you visit here, let me know.